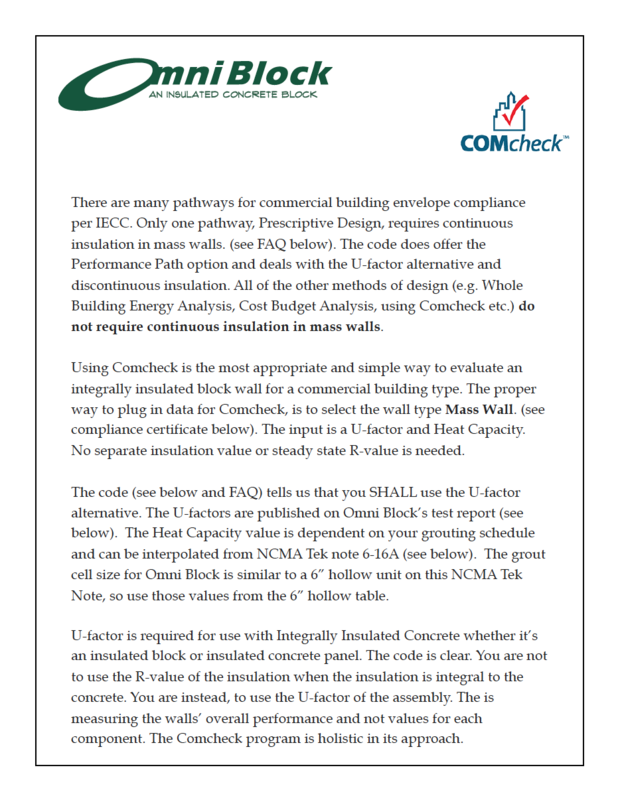 The following pages discuss how to use ComCheck and Omni Block’s U-factor to achieve the code energy requirements. It is assumed that the reader has a working knowledge of the Department of Energy’s software program ComCheck. For a downloadable pdf click here. 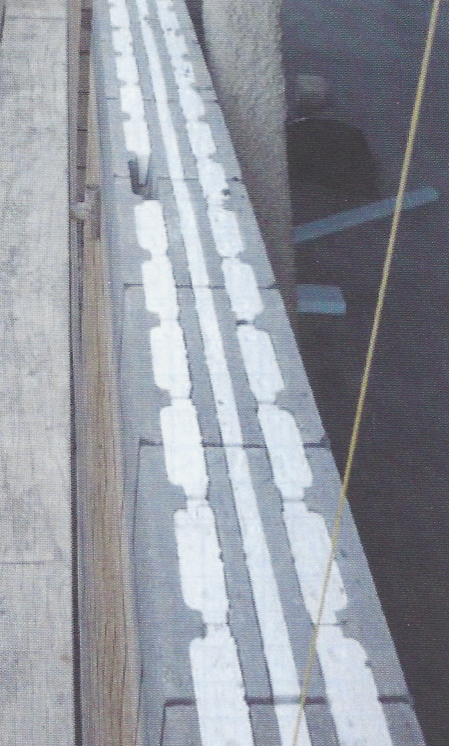 There are insulated block systems on the market that make claims of continuous insulation within their block and upon close examination, they do. However, that examination also reveals that there is no insulation spanning the mortar joints in a total wall assembly. Since mortar joints account for at least 6% of the total wall, this would not be considered continuous insulation. 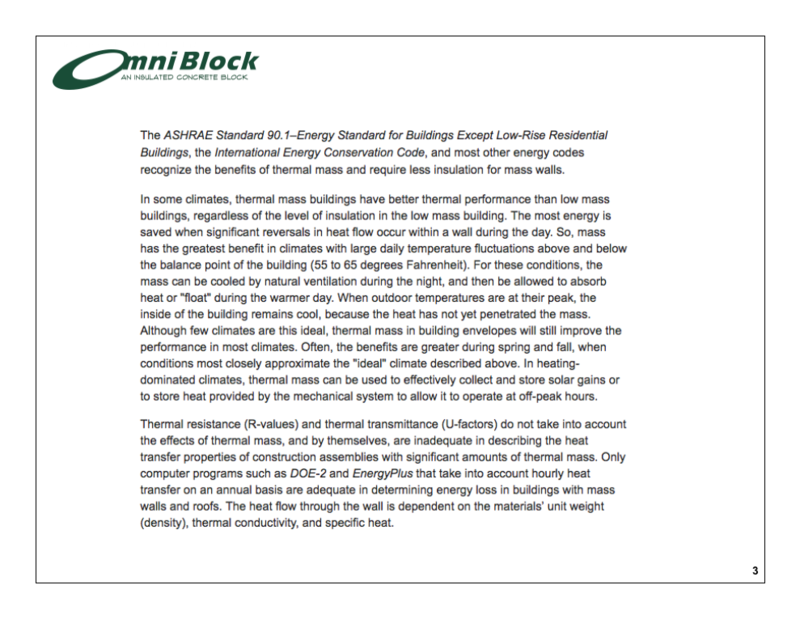 Omni Block does not claim to have continuous insulation. 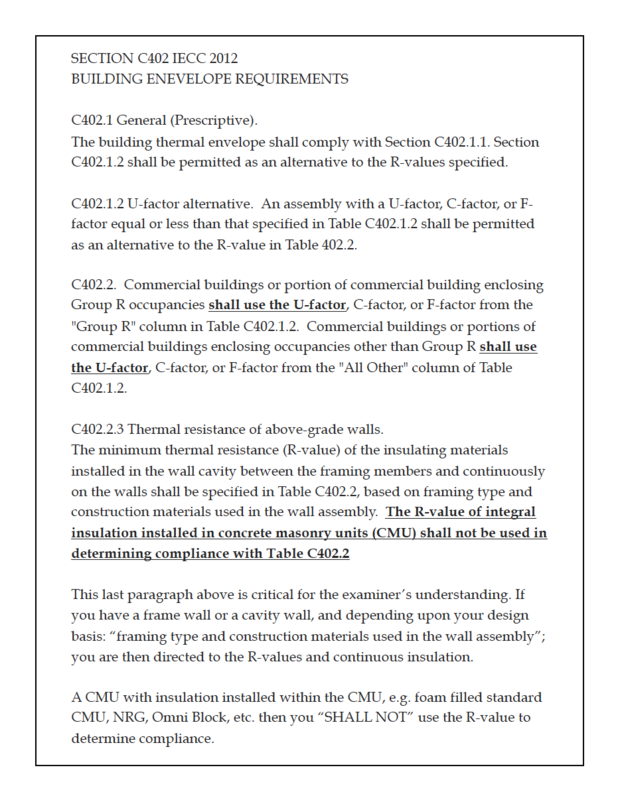 Continuous insulation is not required in the IECC, specifically the Performance Path section of the code. 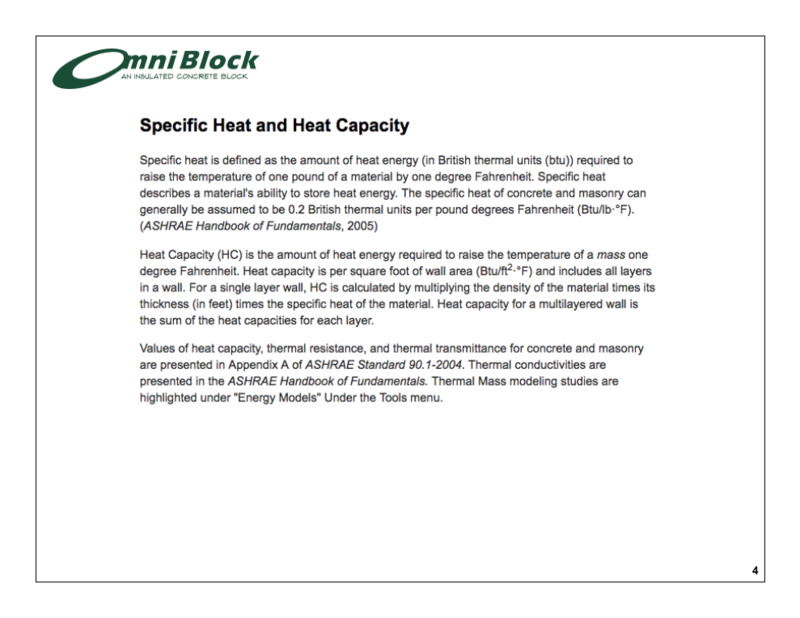 Omni Block does have two independent layers of insulation inserts for the System 8 and 3 independent layers of insulation included in the System 12. Additionally, the insulation in both Systems span the mortar joints (vertically and horizontally). 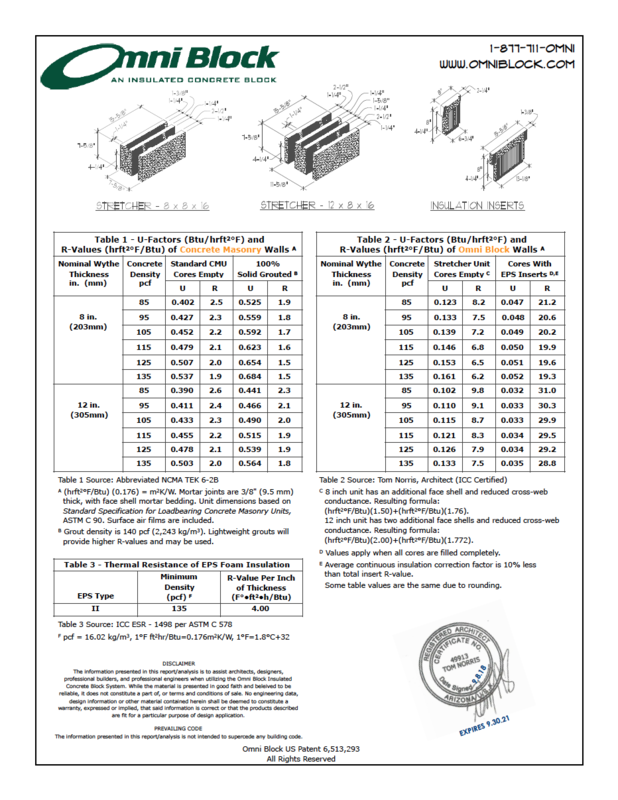 To download the pdf version click here complete with calculations. To view the above in pdf click here. 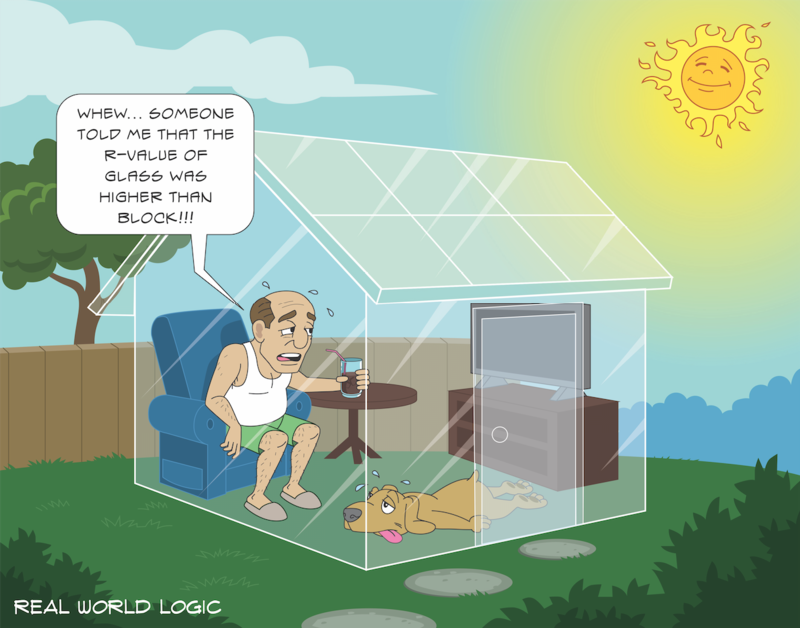 Glass has a higher R-Value than block? 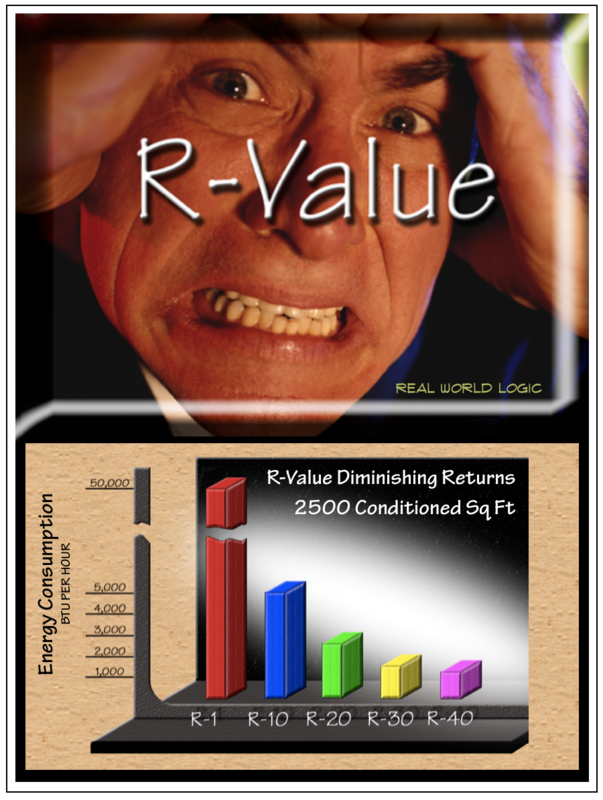 R-Value is the derived industry standard of measuring how products perform in laboratory conditions. However, we do not live and work in a laboratory condition. 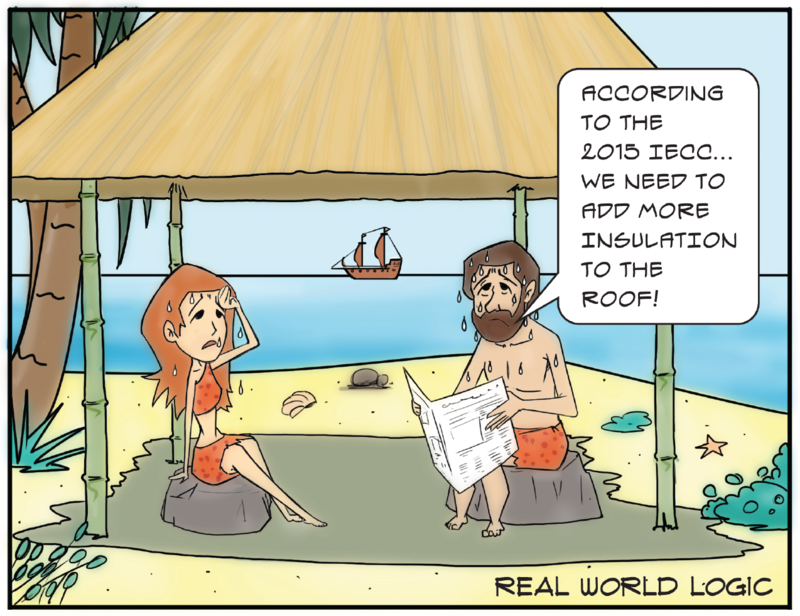 It is therefore important to consider the real world conditions of all building materials. 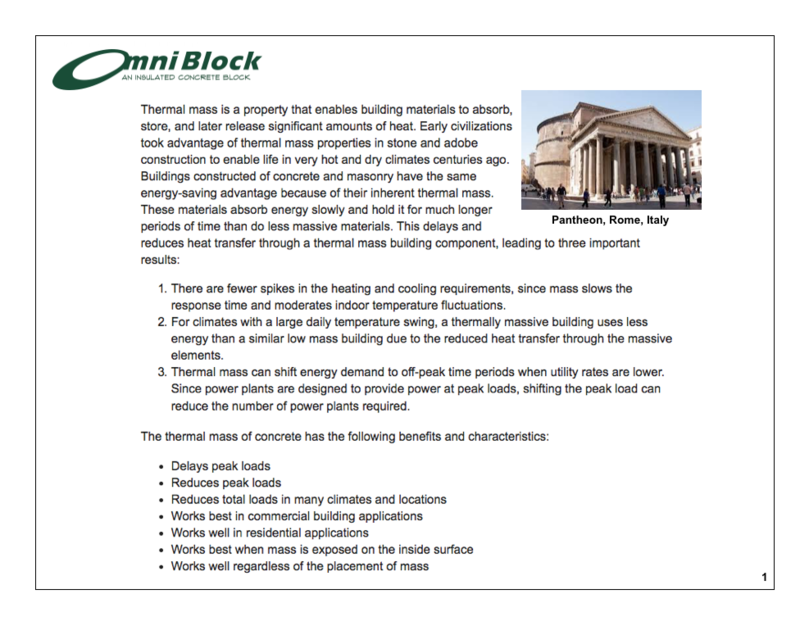 Omni Block is the best thermally performing building product for the money available on the market. Building material R-Values are tested in a uniform laboratory testing method. 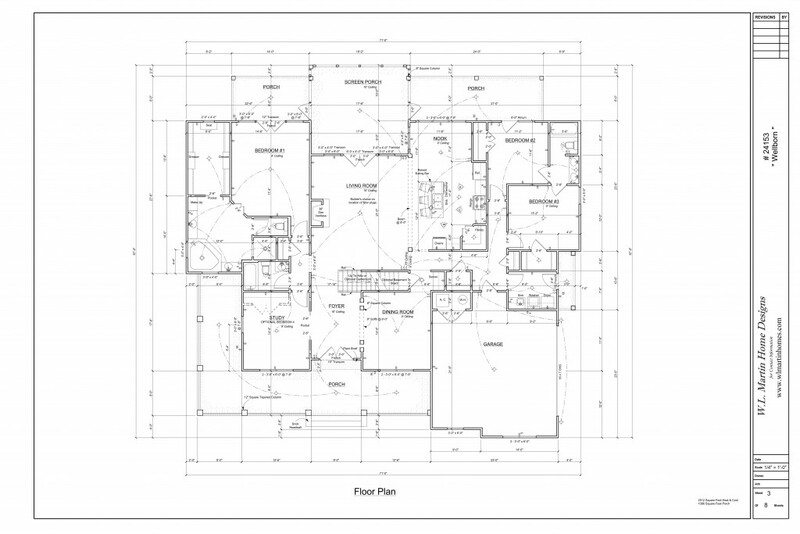 The problem often lies within the “non-perfect” installation techniques that are commonplace in the construction industry. 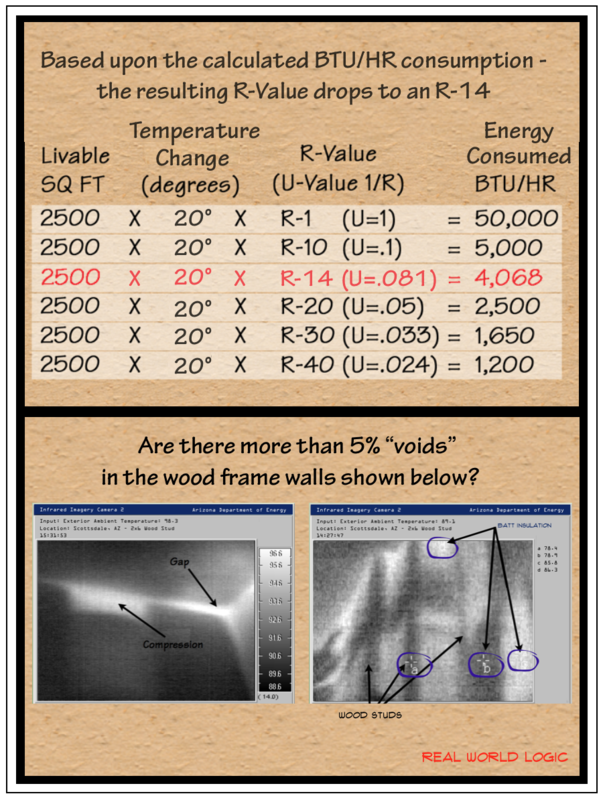 These 3 slides illustrate a) that there is a Law of Diminishing Returns when it comes to R-Value; b) that a small insulation void or improper insulation installation can greatly reduce the expected R-Value performance of a wall assembly; and c) how those voids are shown via infrared imagery (the camera does not lie). Just more REAL WORLD LOGIC from Omni Block. Einstein couldn’t have done this kind of math … How can you? 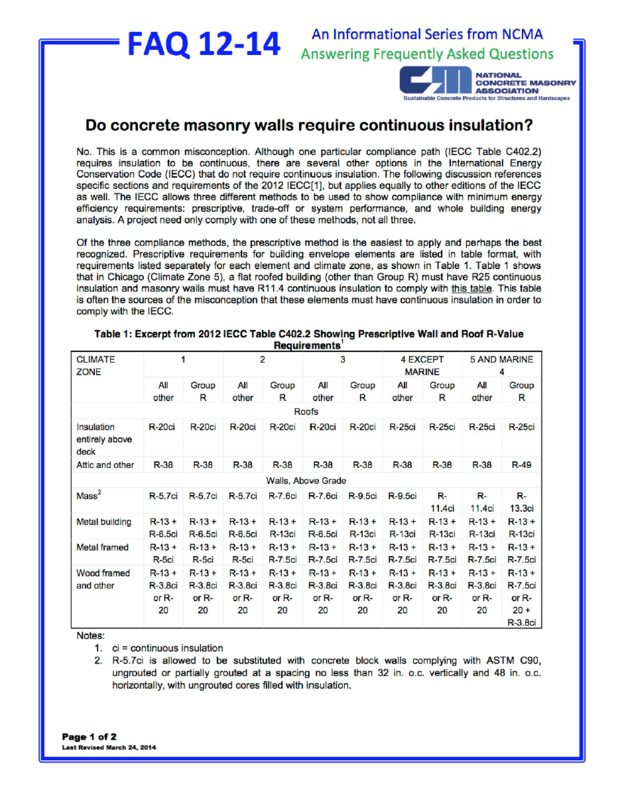 If a 4″ solid grouted block has an R-2.4 (R-Value) and an 8″ solid grouted block has an R-2.7 and a 12″ block has an R-2.8, all per the nationally accredited testing laboratories of the National Concrete Masonry Association (NCMA), and we want to build a 48″ thick wall, we are allowed to add the layers of the individual block units to derive the total wall assembly R-Value. If all units are solid grouted, you have for all intensive purposes the same solid 48″ masonry wall with major R-Value differences. Since heat has “energy”, it is what we are trying to control or at least limit its movement. 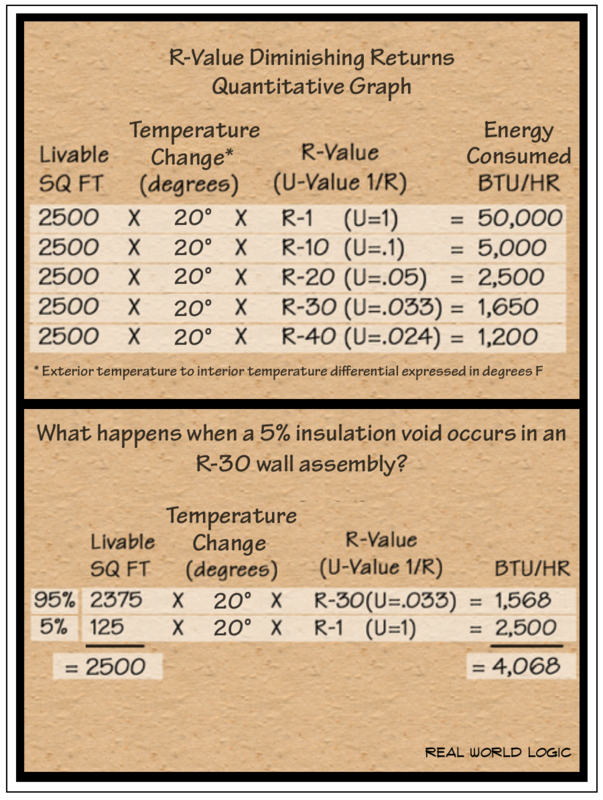 Question: It would appear based upon the layered R-values that the same 48″ wall would “resist” this heat much differently, but would it? 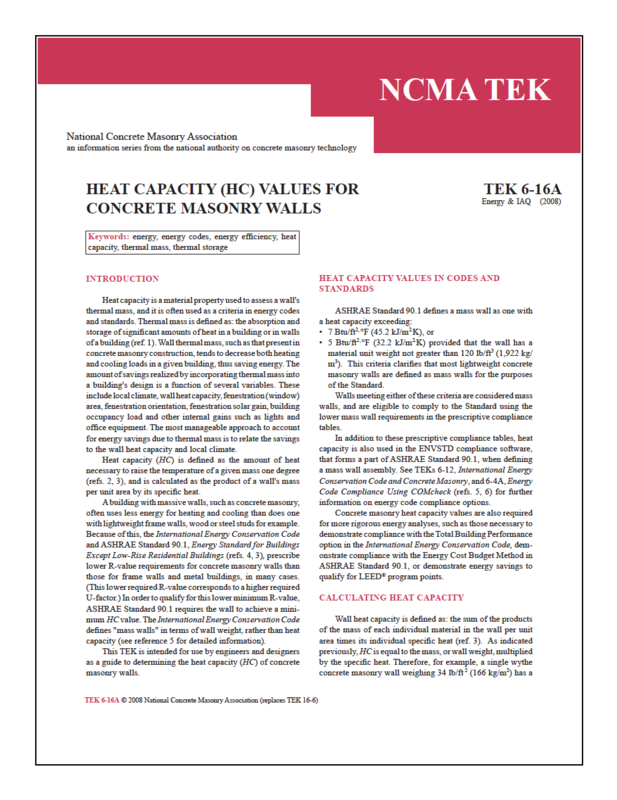 Conclusion: The heat would move through or be absorbed by the thermal mass of the wall assembly at the very same rate making the variously stated wall R-Values inaccurate. The laboratory results are not substantiated by real world applications. 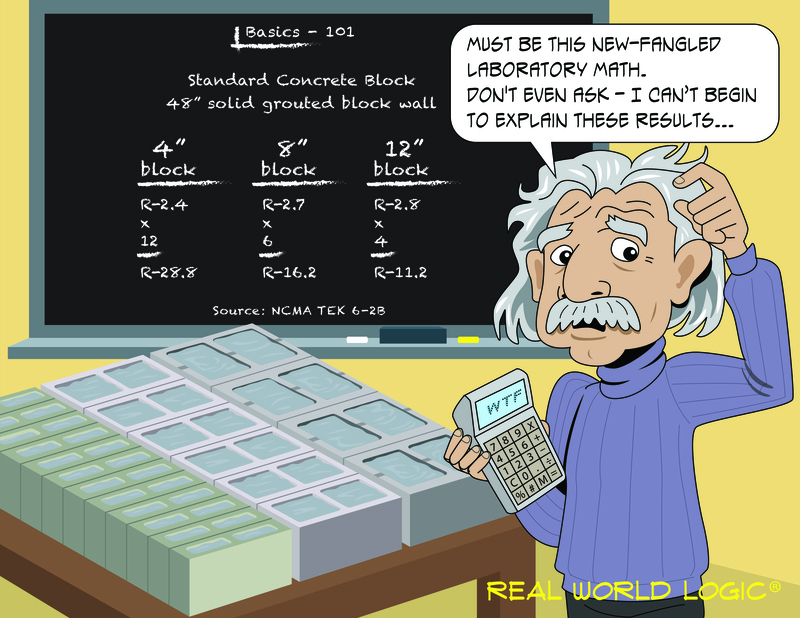 Therefore: The current ASTM wall R-Value test results for block are providing “misinformation” and are not useful. 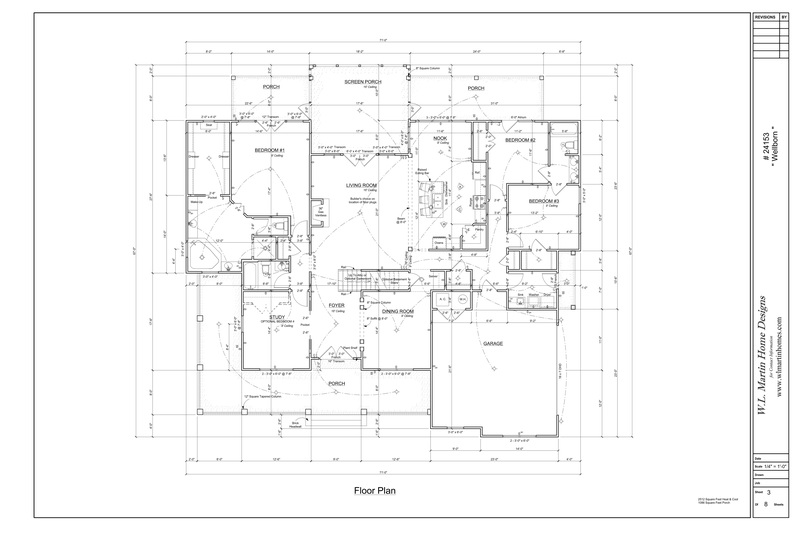 Actually they very deceiving, causing many that rely on such information to make the wrong decisions as to what exterior wall material to use. 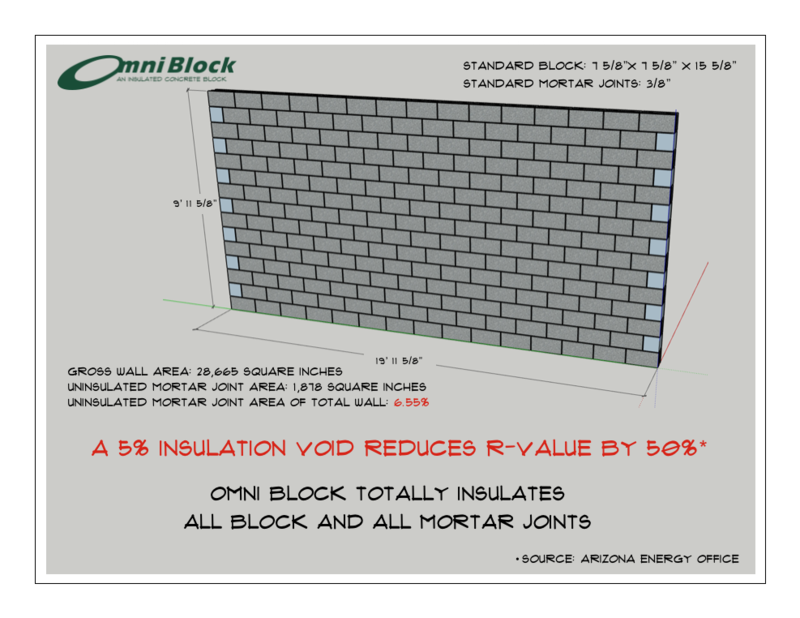 The Omni Block System 12 consists of four layers of masonry and 3 layers of Expanded Polystyrene insulation for an R-29.5 at a 115 lb block density. The single open cell to the right is where rebar will be placed and grouted per structural engineering. 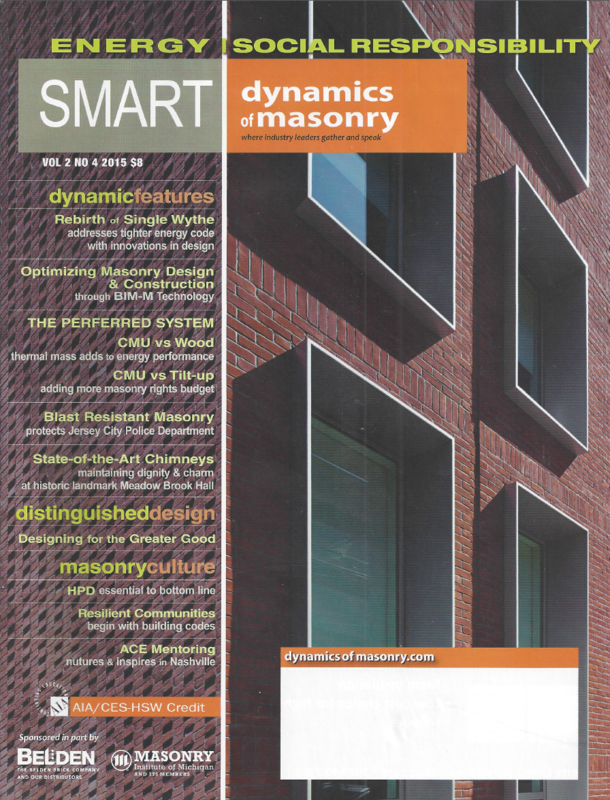 Omni Block was featured in the industry publication dynamics of masonry in an article entitled “Rebirth of Single Wythe Masonry”. 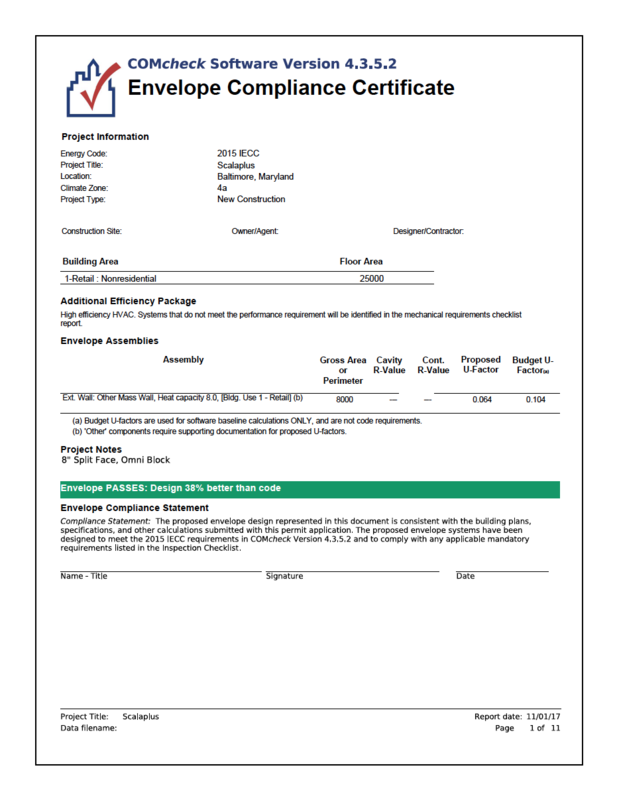 The article effectively addresses how insulated single wythe masonry complies with the International Energy Conservation Code (IECC) which 39 states and Washington DC have adopted. The complete article is at http://digital.ipcprintservices.com/publication/frame.php?i=262705&p=11&pn=&ver=flex. Omni Block Home Beating Utility Projections by 140%! Texas Home Beating Utility Projections by 140%! 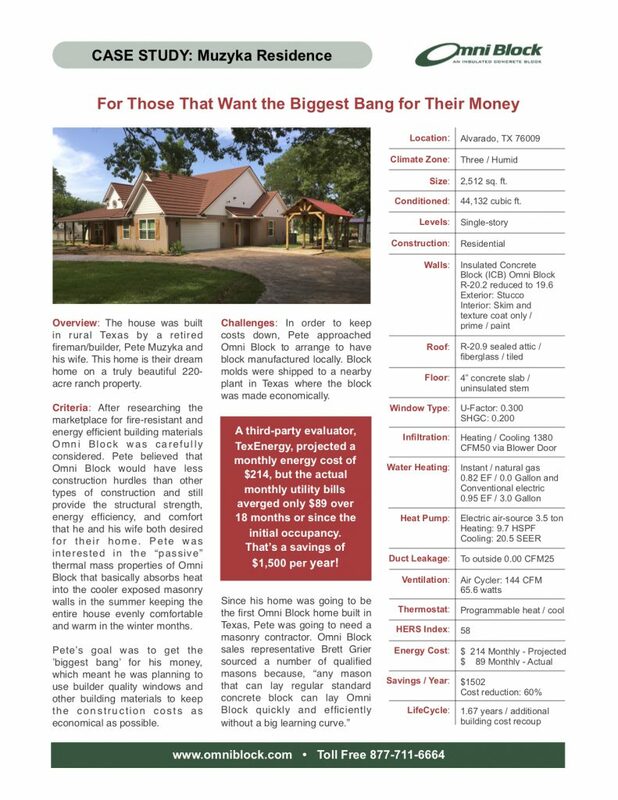 Notice that TexEnergy projected the energy consumption to completely run this house at $2,602 annually or approximately $214 a month on average. The owners have now lived in the home for over 11 months, keeping their thermostat set at 72° in the summer and 74° in the winter. The actual average monthly energy cost has been $89! Statement of fact: This house, built with Omni Block is beating the utility projection by 140%! The only variable is Omni Block. 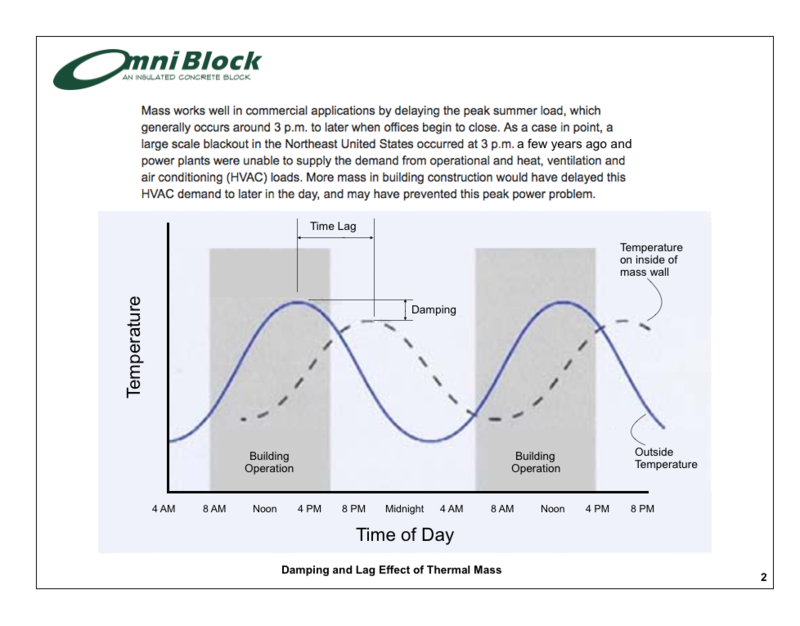 The reason that they are so far off on their estimate is that current software (REM/Rate) that is used to input the data does not adequately allow for Omni Block’s thermal mass affect on the ambient indoor temperatures. 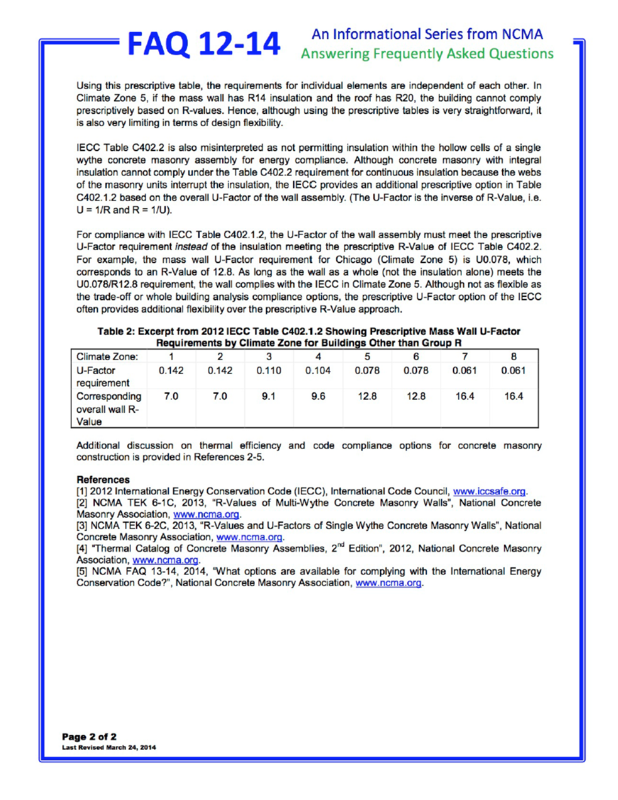 “The 2012 IECC code mandates a maximum Air Changes per Hour (ACH) of 5.0. Many new homes struggle to make that target. 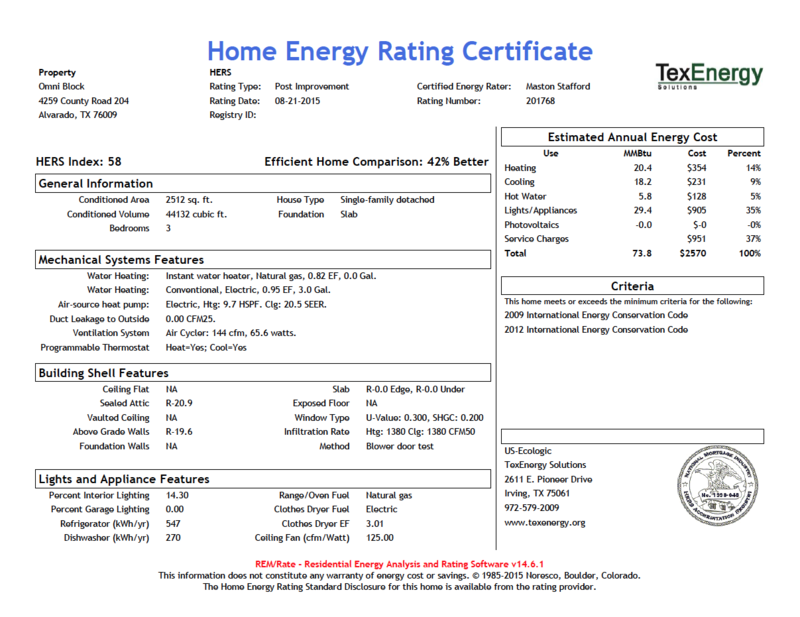 To calculate the ACH of this Omni Block home, multiply the blower door test score of 1,380 CFM times 60 minutes per hour and divide by 44,312 (the cubic footage of the house). The result is 1.88 Air Changes per Hour, which is exceptionally tight. 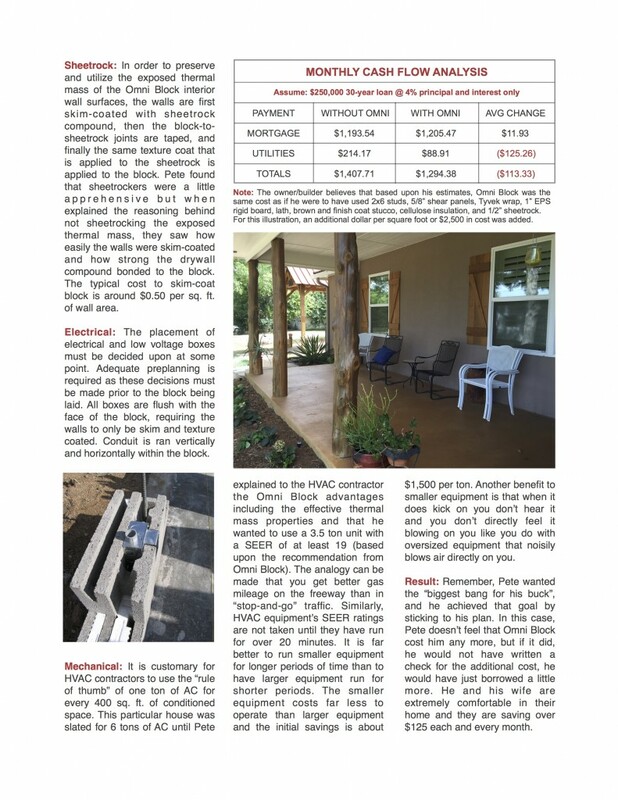 This is one of the tightest buildings that we have tested”, according to Bill Syfan, LEED AP HOMES, HERS Rater and NGBS Verifier.